SU development ignores the Mac interface as a rule. IMHO... the SU team support mac far more than our user numbers warrant. Not IMO. Compared to what? They haven't dropped the platform altogether, that's true. Does this work in sketchup 2015 windows 7 . I've been having the same problem with file preview. Now at the bottom click on (Create Preview) This will change all the Sketchup logo(s) into it's graphic thumbnail. Note: It will not launch the graphic icon, unless you are in Sketchup. Open Sketchup and (Open File). You should see the Thumbnails, and these icons will launch. Steve, I could kiss you! I've been wanting to be able to see thumbnails of my SU files since I got my mac 4 years ago. Thank you so much for this tip! "Avoid keeping more than 3 items on your desk that you can't fit into your mouth." kevsterman wrote: Steve, I could kiss you! I've been wanting to be able to see thumbnails of my SU files since I got my mac 4 years ago. Thank you so much for this tip! +Eleventy! No idea why SU doesn’t bother to support this. I’ve missed it ever since it was dropped. pibuz wrote: "regsvr32 thumbsup.dll" and press "return". installed Sketchup 8 and Sketchup 6 (version 6 installed later than 8 only for AutoCAD DWG files import, but not very usable BTW). Only for .skp files made in version 6 thumbnails were visible. Now I see all .skp files thumbnails!!! explorer shows thumbnails perfectly but in bridge it's only icons... any suggestions? Not a native speaker, point out my spelling (or other) mistakes, I won't be offended!!! does this work for windows 10? i'm just a tad scared of anything in the registry as it's way over my head, so advice appreciated in advance of tinkering. geomp wrote: What's the best solution for Mac? As a new Mac convert, I was frustrated by the lack of QuickLook thumbnails for SketchUp files, and worse, on my Mac QuickLook tried to treat the file as text, taking a long time and then displaying a huge amount of useless hexadecimal data. So I decided to see if there was a simple solution. Here's what I came up with. First of all, although SketchUp saves a PNG format thumbnail inside each file (containing the last view you had open), and has Ruby API calls to generate thumbnails, these images are only 128 pixels wide. For a model of even modest complexity, this makes the image so distorted and blurry that it is useless. So, the first requirement was to create a better image for the file. To do this, I wrote the little Ruby plugin attached. It creates an observer that causes SketchUp to save a jpeg image of the current view each time you save a file. I set the image to 800x600 at a moderate level of compression to make it big and clear enough to see but not gigantic in size. You can easily edit the Ruby if you want a different size. The image has the same base name as the SketchUp file but with extension ".pv.jpg". There is a delay to export the image as you save a file; depending on the complexity of the model you might or might not notice. Second, I wrote a little QuickLook generator, also attached, that looks for the image to go with a SketchUp file and tells the system to use it as a thumbnail. SketchUp does not (at this time) register its own UTI for its files, so OS X creates a dynamic UTI for them. I put the dynamic UTIs for skp and skb files in the info.plist for this generator. I am led to believe that these should be the same on all Macs, so hopefully they will work for everyone. With this generator, the thumbnail image is displayed for any file that has one and the SketchUp icon for files that do not. To implement my system, copy the Ruby plugin into your plugins directory (~/Library/Application Support/Google SketchUp 8/SketchUp/Plugins) and copy the QuickLook generator into ~/Library/QuickLook. Note: by default the Finder hides your Library folder, but you can get there using the Go->Go To Folder menu in Finder. Also, you may need to restart the QuickLook system by rebooting or, if you are bolder, running qlmanage -r in a terminal window. Despite the name of the generator, it actually creates a thumbnail, not a preview. After working on this it struck me that given a well-detailed thumbnail, there was really no need for a preview. If you want to go beyond the thumbnail, you can just open the file in SketchUp. As I mentioned, I am new to Mac, so I don't know all the ins and outs of making this portable. I compiled the generator on a MacBook Pro under Mountain Lion, and I am not sure whether it will work on a non-Intel Mac or on an older version of the OS, as I have access to neither. If it won't run on your system, PM me and I'll be happy to send you the source code. Does anyone have the quicklook function working on OSX under El Capitan? I was looking into this little plugin again. I the quicklook.generator does give a error if i drop direct in the terminal, is that normal. The thumbnails are working but i dont preview them on the files no more. It did work for a small period of time though. I don't know why it stopped working. It is possible that Apple changed something in releases of OS X since I wrote my qlgenerator or that subsequent versions of SketchUp associate the skp files with a different system id. There was so little interest expressed at the time that I haven't bothered to maintain it. I've since moved on to macOS 10.13.2, which might also behave differently than your OS. Plus, SketchUp 2018 comes with its own new qlgenerator, which eliminates the need for mine going forward. That said, you could try the ideas below to investigate. You are using the wrong pattern in grep to search the return from qlmanage. Try qlmanage -m | grep Ske instead and you should see what is handling SketchUp files. If my qlgenerator is correctly installed, you should see entries for dyn.ah62d4rv4ge81g45u and com.sketchup. I had to use these because at the time SketchUp itself wasn't registering anything. The icons will take effect only after you save a file while the plugin is installed, as the plugin is what creates the image used by the icon. It's been long enough I may have forgotten, but I don't think qlgenerators can be run standalone from the Terminal. They hook into a calling chain where they are fed a file and return an image handle, which doesn't make sense standalone. 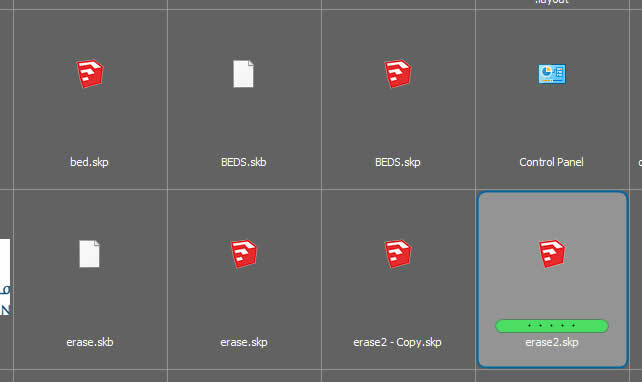 You might also check for a folder named .QL_SketchUp in your home folder (things starting with . are hidden by default - in terminal you need to use ls -a to see them). It should exist, be writable, and should contain an image for each skp you have saved since the plugin was installed. Check your system's log files to see whether you can find anything about quick look errors. Because OS X creates vast numbers of log messages about things that will mean nothing to you, this is somewhat like looking for a needle in a haystack but if you find something it might provide a clue about why it is no longer working. I went on for hours checking and googling stuff. drove me nuts. I even installed Xcode but got to the point where you need to add code which does all the work and look at the folders and files. I didnt know what todo there. So i went on again looking in other files. Then i noticed that when i changed com.skethup to com.sketchup.skp it does work again. This is the altered Plist i got. Heavy models do take super long to save, is that due to jpg creation? Im baffled, i worked for a while and stopped again. I didnt put all my other ql plugins back and so i did. Then nothing happened again. Now ive taken all out accept qlsketchup and still nothing is created?? Also thumb generator was working and that as well stopped now. I think ill do a restart orso. I looked some more, and it seems that SketchUp's own plist files affect what CFBundleDocumentTypes are initially registered for skp files. At some point they went from just com.sketchup to com.sketchup.skp, which necessitates the change you made in my plist. rombout wrote: Heavy models do take super long to save, is that due to jpg creation? Heavy models can take a long time to save even without the jpg generation, but yes it will slow the save even more. You could get a sense of the impact by exporting the model as a 800x600 2D jpeg image, which is essentially what the plugin does. Recent versions of OS X cache both plists and the qlmanage settings. You often need to force them to refresh their caches to get things to "stick", especially if an affected app is open at the time. To force refresh of the preferences cache you can either log off and back on, reboot, or issue "killall cfprefsd" in the Terminal. To force refresh of the quick looks, do "qlmanage -r".